What do you do when you have a surplus of capsicum but your children don’t like it cooked it meals? Easy. You pulverise it and make it into a delicious Sneaky Veggie Napoli sauce of course! Don’t let those nutritious vegetables go to waste in your pantry. Whip up this tasty sauce in less than twenty minutes and serve it on your children’s favourite pasta. Whether your capsicums are green or red, it doesn’t matter (I’ve dealt with both). The passata covers the greenness even if you only have green capsicums. Serve it up with some home made garlic bread and a salad for a filling and well balanced meal. Blitz the garlic, onion, red capsicum and zucchini in a food processor. Heat the oil in a fry pan to a moderate heat. Add the pulverised vegetables to the pan and cook for a minute or so. Pour the passata into the fry pan and mix well. Add the sugar, salt, pepper and basil. Cook on a moderate heat for five minutes. Serve hot with the your favourite pasta. 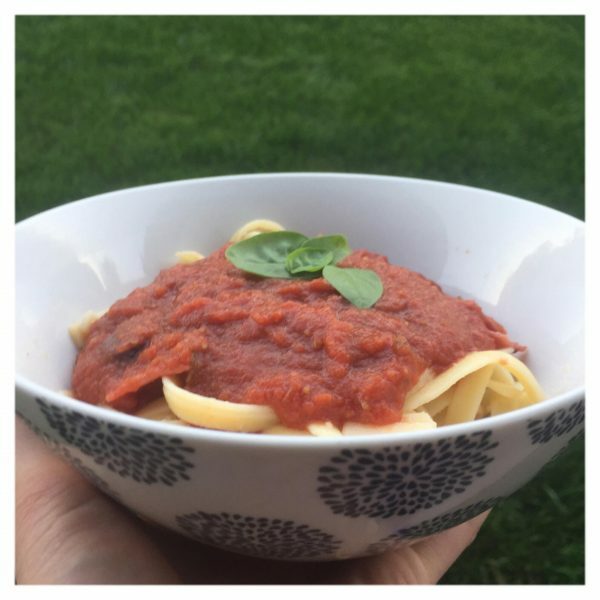 This entry was posted in Recipes, The Organic Place and tagged Family Friendly, Healthy recipe, hidden vegetables, hidden veggies, kid friendly, Napoli sauce, Sneaky Veggie Napoli Sauce, The Organic Place, vegan, Vegetables, Vegetarian.